Fitzroy Island is a slice of unspoiled tropical paradise just off the coast of Cairns and most of the island is a protected National Island Park. The island boasts incredible coral beaches, tropical rainforest, mangroves and extraordinary wildlife. From snorkelling to kayaking and hiking, there are plenty of fun things to do on Fitzroy Island to allow you to make the most of your trip and to enjoy it's natural beauties. Hopefully, after reading these 7 reasons, you will want to make you way over to this gorgeous island ASAP! From all the places I visited in North Queensland, Fitzroy Island definitely has the most pristine waters! I love swimming in water that's clear enough for me to see the bottom and I can assure you that this is the case on Fitzroy Island. 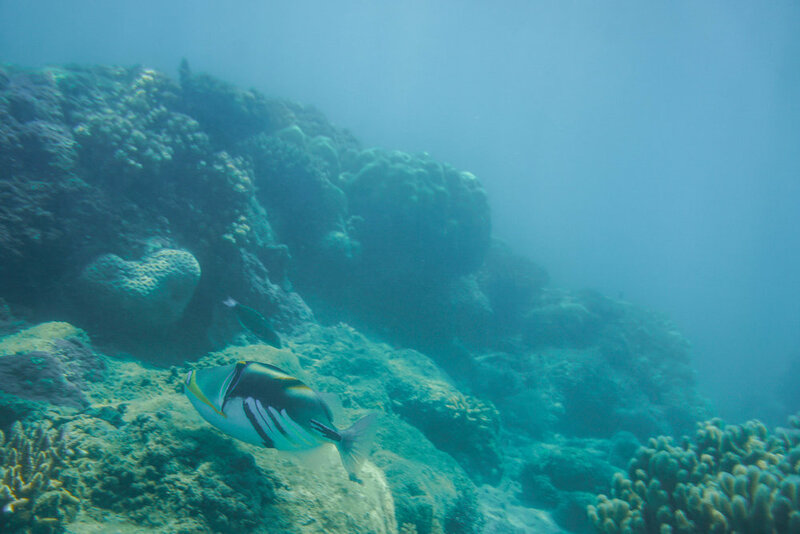 The water clarity also makes the island an ideal place for snorkelling around the reef and the chance to see all the underwater tropical wildlife. From Cairns Marlin Marina you can get the Fitzroy Flyover and it only takes 45mins to reach Fitzroy Island making this paradisiacal island really accessible. I suggest taking the first ferry that departs at 8am and returning on the last ferry from Fitzroy Island at 5pm. That will allow you to maximise your stay on the island especially if you're only going for the day or simply staying for one night. This boutique resort is the only hotel on the island and, in my opinion, it's definitely worth spending the night there to make the most of the island. You can choose between a beach cabin, a studio apartment or an ocean view suite which I personally recommend. Everyone at the resort is really friendly and I'm sure you'll love to be able to relax in the big outdoor swimming pool after a busy day on the island. Nudey Beach on Fitzroy Island has been nominated the most beautiful beach in Australia for 2018 and there's no surprise why... The contrast between the lush tropical greenery, the white coral beach and the clear blue sea is just incredible! FYI - despite its name, it's not a nudist beach. Welcome Bay is one of the ideal spots on the island and in Queensland to see turtles swimming by the bay. The island also has a Turtle Rehabilitation Centre, which is a voluntary organisation that looks after sick and injured turtles and helps them get the strength they need before being let out into the sea again. There are daily tours to visit the centre and to get a good understanding of the work the team carries out and the dangers which sea turtles increasingly face every day. Considering that the Great Barrier Reef is within swimming distance of Fitzroy Island you won't want to miss out on the opportunity to go snorkelling at the sheltered beaches (Welcome Bay and Nudey Beach) or go diving a bit further out. You can hire all the gear from the Fitzroy Island Dive Centre which is next to the resort. It's a PADI accredited dive centre and the staff are really friendly so why not try an introductory diving course with a qualified instructor? That's what I did and I really enjoyed it - On the first day, I was given a theoretical introduction to diving and then did a dive with all the equipment in the dive pool which lasted about an hour or so. On the following day, I went diving in the reef with my instructor. We went down 10m underwater which as a bit challenging at first due to the pressure change but once I got used to it it was incredible to just swim underwater and observe all the beautiful marine life and tropical fish. We spent a good 40mins underwater and it was an unforgettable experience! It's definitely made me want to get my PADI certification. There are two lovely hiking trails that take you up to the lighthouse and to the summit of the island. Considering how hot it can get I suggest doing the walk at sunrise and you should also wear some comfortable walking shoes with a good grip because it's pretty steep. It took me around 45mins to reach the summit but I do walk rather quickly so I'd give yourself a good hour or so to reach the top - coming back down is lot easier and quicker of course! You can do a loop by going up the lighthouse trek and going down the summit trek. Trust me, the 360 degree view over the island and the Coral Sea from the top is really beautiful and you'll automatically forget about the hike... There's also a walking track that takes you to Nudey Beach and another one which goes through the tropical rainforest. Has this post made you want to go to Fitzroy Island?